The Scripting.FileSystemObject Object (FSO) is a useful tool for performing many file system tasks. There are two ways to create the FSO Object — early and late binding. First, set a reference to the FSO Object Library. 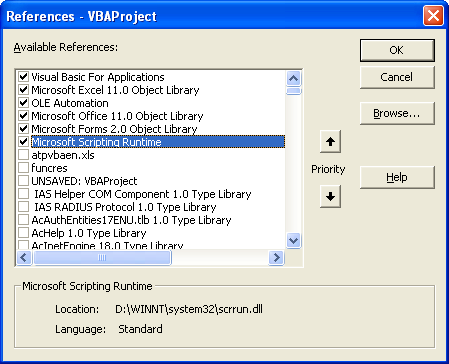 In the VBA Editor, go to Tools » References and select “Microsoft Scripting Runtime“. You can also click “Browse” and go to %windir%\system32\scrrun.dll. As usual, we recommend late binding to avoid having to remember to manually set a reference to FSO by going to Tools » References. The CreateFolder method creates a folder and returns it as a Scripting.Folder Object. This method lets you read or write text files. You can also use this method with a Folder Object. The DeleteFile method is used to delete files. Like the CopyFile method, this method accepts wildcards for deleting multiple matching files. The DeleteFolder method can delete folders as well as any files contained therein. There is no need to delete the files inside the folder first. We use On Error Resume Next because an error will occur if the folder doesn’t exist. This is exactly what we want so we don’t care if the method throws an error. Used in conjunction with the CreateFolder method, the FolderExists method is used to determine if a given folder exists. This check is usually done before trying to create a folder. Similar to the CreateFolder method, except the GetFolder method returns an existing folder. This method returns a Scripting.Folder Object. The Windows folder (0), the system folder (1), or the localtemp folder (2). You can use either the constant or its value, but if you use constants, you must declare them in your code.